Once again, there was no Ork combat photographer on the field of battle—which is a shame, since Supreme Orkish Commander Glarsnot Bloodcurdle was reduced to a few blurry phone cam pics in his latest foray against 1,500 points of Imperial Guard. 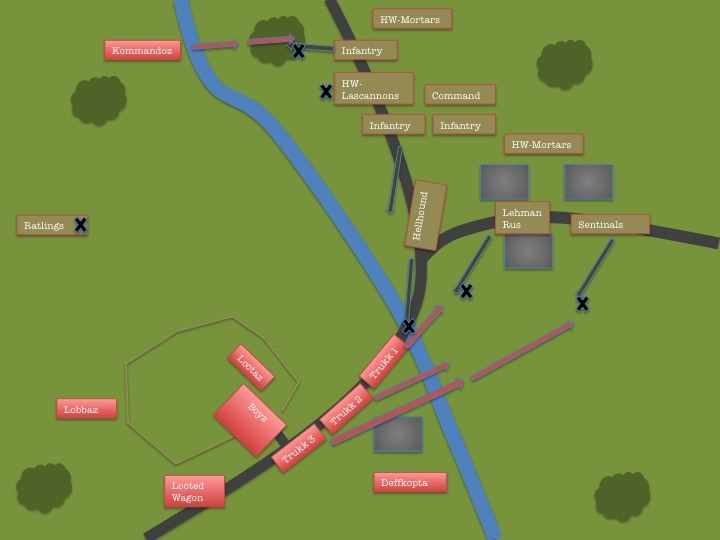 The battlefield was centred on a single bridge over a small (and fordable/difficult terrain) river. To the west of it lay a fenced scrapyard, and to the east a small town. Small woods were dotted elsewhere. The scenario was Seize Ground, with a Spearhead deployment, and the objectives were the town, bridge and scrapyard, plus the northern and southern entry points of the main road. The hummies deployed first, with a Hellhound and Leman Russ Punisher in the town, and an infantry platoon (with three infantry squads, two mortar and one lascannon heavy weapons squads, and a platoon command squad) further back, together with the company command. The orks responded with a unit of Lootaz in the scrapyard, and a large mob of Boyz moving from the yard towards the bridge. Three Trukk mobz (one of plain Boyz, one of Ard Boyz, and on of Meganobz plus Glarsnot Bloodcurdle himself) were also positioned on the road approaching the bridge. A Looted Wagon (with boomgun) were positioned further back for fire support, as was a battery of three Lobbaz, and a single Deffkopta. Ratlings immediately infiltrated north of the Lobba battery. Kommandoz infiltrated nearby, further to the east. The initial IG fire on the Orkish positions was devastating, especially from the 6 mortars that they were fielding. All but one of the Lootaz were killed. The Hellhound dashed forward and flamed the approaching Boyz, while the Sentinels tooks down the Deffkopta. Fortunately the Ratling fire was ineffective. The Boyz advanced, assaulting the Hellhound and ripping it open (with a Nob Powerklaw) like a can of tuna. The smouldering wreckage now blocked the bridge. The Lobbaz zeroed in on the Ratlings, killing most and forcing the rest to flee. The Kommandoz advanced eastwards. The remaining Loota stood his ground, and returned fire against the Lascannon squad, killing most of it. Glarsnot Bloodcurdle declared a Waaagh. The first mob of Trukk Boyz ran forward from their shaken Trukk, and assaulted the Leman Russ, pulling it open like, well, another can of tuna. The mob of ‘Ard Boys similarly raced forward, dismounted, and assaulted the Sentinels, destroying two of the three. The Kommandoz, whittled down to a small handful by Imperial Guard fire, nevertheless approached the woods and assaulted the squad there. The fighting continued between the Kommandoz and Guards, and between the ‘Ard Boyz and Sentinel, with the latter destroyed. The Guard squad on the bridge opened fire on the two Orks moving towards them–the sole survivors of the first Trukk mob–and missed them entirely. The two Boyz assaulted, and wiped them out. The few Guards remaining in the northern woods were routed by the one remaining Kommando Nob, who advanced towards the road. The Loota took out the northern mortar squad, while the mortar team in the town was assaulted and slaughtered by the ‘Ard Boyz. The Meganobz advanced to reinforce the two Orks now holding the bridge. The Lobbaz destroyed the last remaining infantry squad. The main Boyz mob–well below half strength–ran back to re-secure the junkyard and southern road objectives. This was actually my first ever battle against IG–I usually play against Space Marines, Chaos, and Nids. It wasn’t an armour-heavy list, against which Orks can have real trouble. My opponent hadn’t played much against Orks either, and fortunately pushed his tanks a little too far forward, where Nob powerklaws could work their snip-chop-crunchy-squish magic. The hummie infantry were little more than roadbumps, but the heavy weapons squads were a real pain (especially the mortars). Fortunately they’re very vulnerable to Loota fire. My Lobbaz were worth their grotty weight (and mere 97 points) in gold. On the other hand, the Meganobz didn’t do much–their Trukk was stunned, and then their advance was slowed by clunky power armour and the need to cross the river. Finally, I do like good scenery–both the quality of it, and a table rich with it. It much enhances the tactical elements of the game, I think.